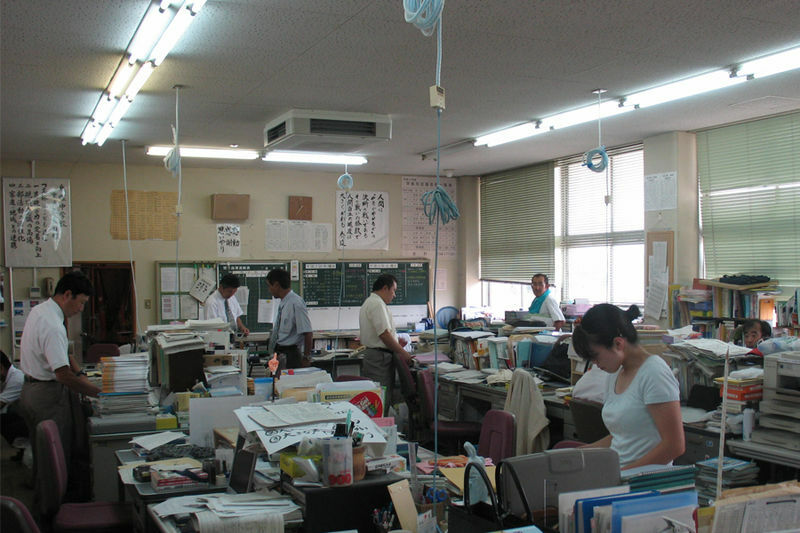 A typical Japanese school staff room. I'm sure all of these people are lovely. Thanks to Japan's system of workplace transfers, every new year of work here is like a co-worker lottery. The grand prize is a team of socially adept, caring, hard workers with whom you'll spend a smooth year of work. The grand un-prize is a year-full of people you can't stand and an all-you-can-eat buffet of frustration and despair. Occasionally power hungry, often ostensibly insane, always annoying. It's not uncommon for this woman to be an extremely capable teacher (but certainly not always); and students usually don't dare misbehave in her class. But she's a crazy horse. Stay well back and thank the stars you aren't her husband. This teacher is either a first- or second-year newbie, or he/she is starting to realize that "teacher" was not an appropriate career path. Deathly afraid of the classroom, the Nervous Youngster will use any number of terrible teaching tools (word searches, connect-the-dots, subtitled (or even dubbed!) Disney movies, giant jan-ken games) over and over again just to cling to some shred of comfortable ground. Students' progress through the curriculum may be months behind other classes, and when it becomes absolutely necessary that the students move ahead in the textbook, instruction generally comes in the form of worksheets and 30 minutes of awkward silence. You know when one of your classes goes badly, and you feel ill and wonder how the JTE sees you? That must be what it's like every class for these teachers. This guy is in his last few years of teaching, and he knows that he's in an important enough position that no one could actually fire him. Whether he's lost interest in teaching or is simply too busy with all the other ridiculous non-teaching demands of a Japanese school teacher, his classes start to slide downhill into uselessness. When you're in the classroom with him it feels like he just doesn't care anymore, and it rubs off on students fast: Heads get buried in folded arms, and the classroom is filled with the familiar sound of hands fumbling around in pen cases to find Xacto knives--a sound always preceding the appearance of intricate and inextinguishable anime character faces all across the desktops in your classroom. Thankfully, it's not all bad. Occasionally you'll find yourself with a fairly young but talented, rising-star teacher who you wish all your classes were with. This is the teacher with whom the whole concept of "team teaching" seems to make sense. You play off each other in the classroom, reframing boring textbook dialogues as dramatic soap-opera re-enactments and peppering lectures with interesting tidbits. The students absolutely love your classes, and even the ones who slept through class last year are awake, alert, and enjoying school. Nice. That's your lot for today. If you have anything to add please let us know in the comments. Otherwise, see you again! the one with severe lack of English (often combined with the newbie), who asks gives you tasks in cryptic riddles, and is then surprised when you misinterpret them. And the one with the weird unexplained hatred towards you, you know, the one who hints at the fact they are a little bit racist towards gaijins, and wants to talk to you ALL of the time about how much better Japan is to, well, anywhere else! 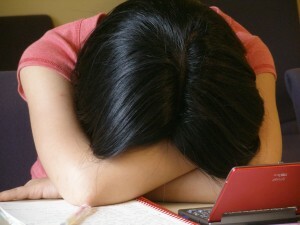 well there are alot more "types" of individuals who work as japanese teachers here in this country. Some can reflect almost exactly what you mentioned above or be similar too the types mentioned above. But for the most part I have worked with JTE in the last 9 years who were serious about there job and would try to do there best. I may not agree with there methods, but they are forced to for the most part, because its all about passing tests...and not speaking english. I have encountered a few mavericks, and they are refreshing in their approach, but they can be annoying also. Absolutely agree. :) This article is meant to entertain, and we don't *actually* believe that anyone is a cardboard cutout of a human being. I think most people--ALT and JTE alike--take their jobs seriously, and there's a lot more of the "good" types than mentioned here. The other guys just make much more entertaining writing material. I had a number one mark students wrong when they technically were quite correct. Asked about it, reason was that the textbook didn't cover it. I've seen the same thing, although teachers usually ask my opinion on something if they aren't sure about it. I can understand the theory behind it if they think the student is just guessing, but a right answer is a right answer. With the mass migration of foreigners from Japan last year post tsunami, English schools are quite desperate for teachers. I understand their strict 4 year college grad criteria has dropped to a 2 yr degree in anythng. Heaps of ALT jobs in Tokyo. ie setup a job alert on www.alttokyo.com or check Tokyo classifieds, or other online Japan blogs. Sallery has not changed though, dont expect to get rich on 250,000 yen/month as an alt. wow your scaring me off from becoming an ALT! I am now in process of a direct hire of the Tokyo School Board which is part time and will pay fairly well. Problem is I have never taught anything in a classroom and I am 43. I have been an actor for the last 8 years here in Japan. Maybe I will just stick with that career since it seems easy in comparison- no preparation, I can take jobs when I want to or refuse them. One thing though the same can be said of types of directors.